One of the main requirements for protective coatings is the ability to confer water resistance to painted substrates. 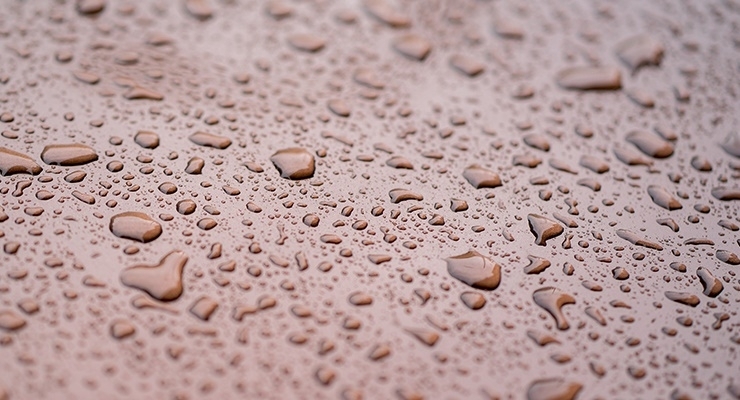 Since the binder is a major part of most coatings, on-going research in emulsion polymer design is aimed at providing more effective barrier properties by increasing the hydrophobic nature of the polymers produced. That, in turn, requires a means for effectively and efficiently polymerizing hydrophobic monomers. Attempts to make polymers of very hydrophobic monomers, such as those of long chain acrylics or of vinyl branched esters that have carbon chain longer than C8, using common sulfonate surfactants have failed because of massive coagulation and/or very low conversion (1, 2). Because of the inability to polymerize very hydrophobic monomers by emulsion polymerization, the coatings industry is forced to employ costly techniques such as use of high temperature and pressure, use of organic solvents or other monomers to act as solvents for the hydrophobic monomer, mini-emulsion polymerization, use of macromolecular organic compounds having a hydrophobic cavity, such as cyclodextrins, use of high levels of surfactants, etc. (2-5). A recent patent application (1) claimed an emulsion polymerization process of vinyl branched esters with the use of at least one surfactant having a CMC of less than 0.05 %, which was specified as sodium bis-tridecyl sulfosuccinate (Aerosol TR® 70%). The drawback of this surfactant is that it contains ethanol, a flammable solvent; and its use as a single surfactant in emulsion polymerization might not be effective. This paper describes a simple emulsion polymerization process using a single DPOS surfactant for polymerizing hydrophobic monomers, including Veova 10 monomer (Tg= -3 ⁰C) and Isodecyl methacrylate (Tg= -41 ⁰C), using ammonium persulfate as the initiator. Veova 10 monomer is thevinyl ester of neodecanoic acid (10 carbon atoms) and Isodecyl methacrylate is a C10 methacrylate. It also demonstrates promising copolymerization and terpolymerization of these hydrophobic monomers with harder monomers, such as methyl methacrylate (Tg= 105 ⁰C), styrene (Tg= 100 ⁰C), and tert-butyl methacrylate (TBMA, Tg= 107 ⁰C), using the same surfactant and initiator.